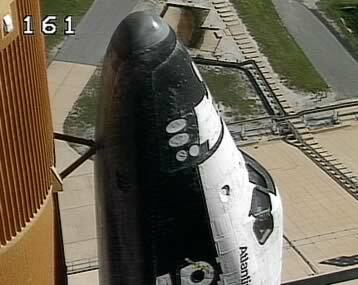 The grounding of NASA's Space Shuttle fleet following the Columbia accident in 2003 is about to be lifted. Hundreds of modifications have been made to both the Shuttle and mission procedures in the last two years to enhance the safety of future missions. NASA will return Space Shuttles to flight with the coming mission of the Shuttle Discovery. The crew of seven astronauts, including Australian Andy Thomas, will be kept occupied with a demanding schedule, including testing new safety techniques and delivering much needed supplies to the International Space Station. Discovery's launch is targeted for July 13 with a launch window that extends to July 31, 2005. Free-to-air satellite television offers a detailed insight into spaceflight activities including the shuttle missions via NASA Television. NASA TV is an educational media outlet that provides NASA related programing 24 hours per day. During Space Shuttle missions, NASA TV is compelling viewing. For the weeks before the launch the channel broadcasts daily updates, briefings and press conferences of pre-launch activities. However the real action begins the day of the Shuttle blast-off. Around six hours before the launch the continuous mission coverage commences which extends right through until the mission ends some hours after the Shuttle landing. Viewers are treated to spectacular live video and audio of the controllers and astronauts which when combined with the downloadable resources at www.nasa.gov offers a front row seat to all stages of the space flight. A schedule of major events in the mission timeline is available from the NASA website. Downloading the mission press-kit will enable you to plan your viewing to ensure you don't miss highlights such as launch, space station docking and landing. NASA TV is available from Intelsat 701 located in orbit above the international date line at 180 degrees east. Small Ku band dish users in New Zealand can tune into NASA TV via the TVNZ bouquet on Optus B1. In addition to the continuous coverage direct from NASA TV the launch and major mission event coverage is also usually carried live on the APTN Direct live event video feed channel on Asiasat 2. NASA Television is featured in the MediaExplorer package on DVD Disk Four. NASA television can be troublesome to receive from Intelsat 701. Frequent changes in the power of the signal and the need for a feedhorn capable of circular polarisation add to the challenge of receiving the channel on C-Band. For viewers in New Zealand, NASA TV has recently been added to the "easy to receive" TVNZ digital channels on Optus B1, 12456, Vertical, Symbol Rate 22500, FEC 3/4. NASA TV for Australian viewers remains available via Intelsat 701 and via the APTN Direct channel on Asiasat 2.